LIFE BELOW 40 HZ!!!!!! COME AND JOIN US!! Get the special parametric eq. and our modified bass computer BX10!!! YOUTUBE: "THE WINDIEST 6 12S SETUP EVER! *RIPS BEARDS OFF! *" 7:40 INTO THE VID!! AND COME ON BACK HERE!!! 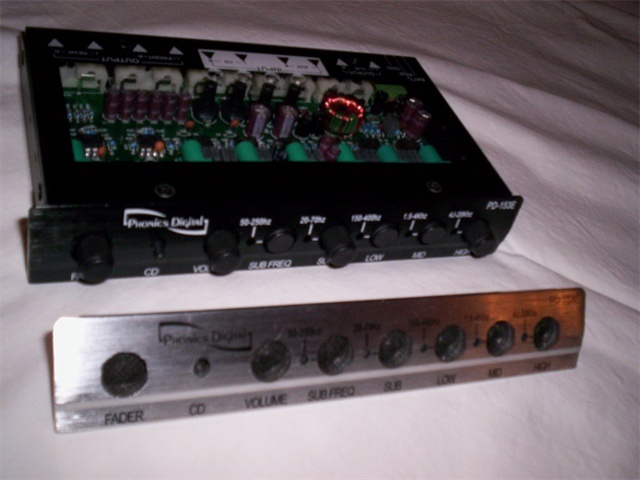 This is a "parametric equalizer", it is a frequency tunable equalizer. It takes music and equalize's specific frequencies that YOU choose. It works on all recorded media, like CD's and mp3. It also adds the sub harmonic spectrum of whatever sound is put into it. The amount of tunable, frequency specific equalization you want to add is controlled by 4 individual frequency "volume" and "tuning" control's, + main output volume to amplifiers + front to rear fader control. "Click here for "epicenter" FREQUENCY CHIP;"
The most important point about this parametric equalizer is that it has 20 hertz frequency. the ULTRA VIBRATION 20 to 40 HZ bass, and the "WINDY" bass at 15 to 20 HZ. We know that ear doctors and engineers that dont understand high Sound pressure Level say you cant even hear bass below 20 hz; well us "BASSHEADS" know there wrong. I hear(or feel) 10 HZ to 15 HZ everyday in my car stereo off rap cd's, britney spears, rock, even radio, of course jungle and rave music. Massive 7 volts RMS output, 2 separate stereo inputs and aux inputs. 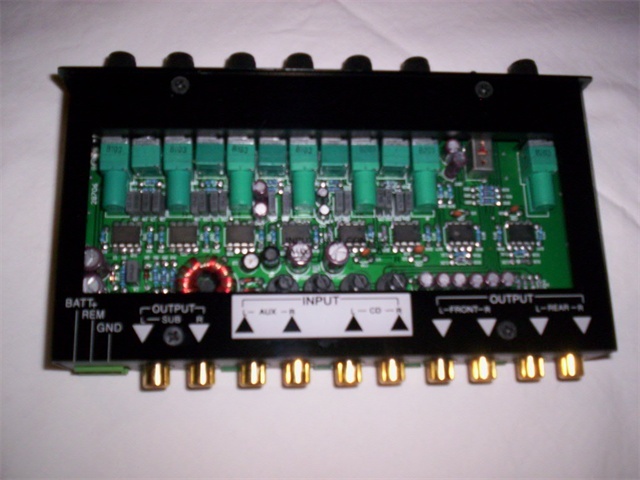 Install this after radio, but before epicenter or other equalizers or amplifiers for best results. Make sure your amp has no sub filters or 20 hz kill filters, or just turn off filters. Remember our BX10 will half the frequency so thats FLAT TO 10 HZ!!!!!!!!! Get it now for just $99 U.S.Dollars! 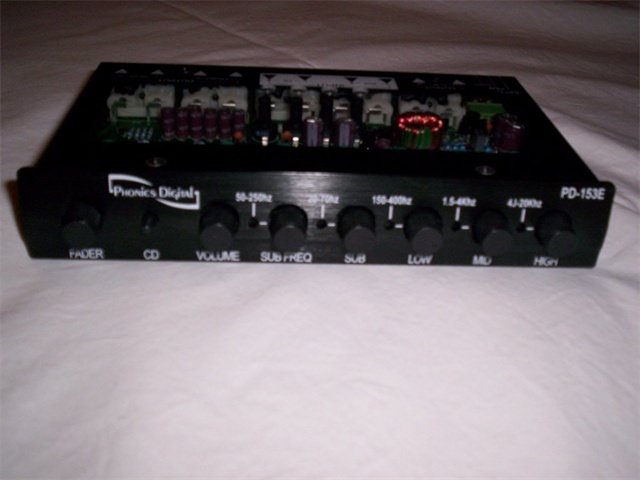 1. it has a built in variable low frequency cutoff!!!!! from 80 hz to 10 hz. 2. our factory at makeitlouder.com, modifies it to have a VARIABLE TUNING low frequency cutoff down to about 5 HZ ! 3. it has extremely powerful and bright blue neon bass lights that blink to the bass, so when a 20 hz note plays it blinks 20 hz! 34 hz 34 blinks ect. you can "see" the bass vibration. makes your car kind of look like a disco, and makes your bass enjoyment much better. If you want to enjoy the fierce superdeep bass in the under 40 hz range then you need this bass synthesizer. Just turn the bass cutoff knob until you get the "scary bass" you have been looking for. Get 1 or 2 more octaves of deeper musical bass. Don't just settle for bass when you can have a little "wind". To make sure that your speaker box is ready for this, you need to have a air tight sealed box or retune or just make sure your vent tuning is lower than about 25 HZ. We like to tune between 24 HZ and 18 HZ and the bigger box the better. If you already own a box you can stuff the vent with a fat towel or you can lengthen the port to maybe 2 times the normal length, or if you got 2 ports block 1 of them. And you use good loudspeaker subwoofers like; OURS, RE, ALPINE TYPE X, ATOMIC, MMATS, MEMPHIS, ADIRE, CERWIN VEGA,JLW7, DIGITAL DESIGNS, TREO, ORION H2s, JBL GTi,, MTX THUNDER 9500's,or the ROTARY THIGPEN WOOFER ... you know the good stuff, because your woofers will MOVE!!!!!! A low power woofer may over pump and over excursion (bottom out), and possibly hurt it. Thats why epicenter doesnt talk about frequency chips. Tune from 20 hz to 80 HZ, we recommend try around 30 HZ first. Then if your woofers can handle it try the the 20 HZ and 10 hz. That should be enough, but if you want to go pyscho rotate the 2 knobs to the 5 HZ point, if your woofers can handle it. We can also figure it out which frequency is best for you.Just call or email and tell us your woofer brand and amplifier power and box /port size. The sound comparison is like this: A car stereo system without an epicenter compared to 1 with an epicenter is like a car system with an epicenter compared to this bass synthesizer. To prove it just rotate 2 the bass cutoff knobs of this bass synthesizer up to the "epicenter" factory 32 HZ and it sounds sad and weak. Installation is very simple and takes 5 minutes and no soldering!. 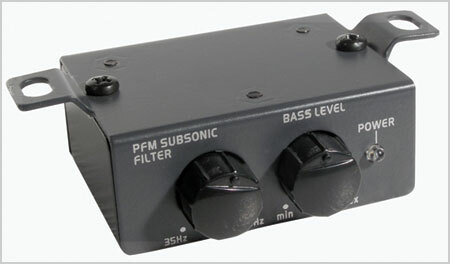 The bass synthesizers do NOT increase your ultimate db level, although below 40 hz they do provide more energy. What they do is increase your FUN level. Remember that basically every speaker in the world loses db the lower in frequency you go, so this is a daily driving or S.Q.L. sound QUALITY chip not a sound PRESSURE chip. 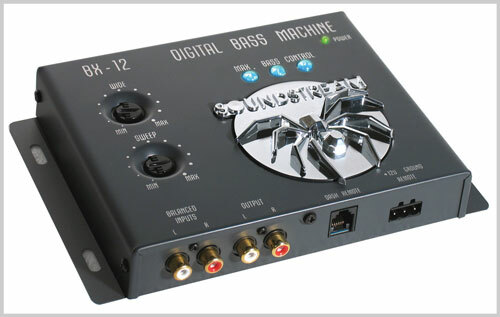 MODIFIED Soundstream BX 12 with frequency tuning to 5 hz, brand new is $169 U.S.Dollars.